There are actively proceeding world discussions about oil and alternative energy sources. First of all should be mentioned bioethanol, as the most capacious product. Today oil and gas are the main power sources in the world and therefore reduction of their use is the main priority in work of many countries governments. These days many farmers invest in construction of the enterprises for biofuels production, raise corn prices and participate in profit distribution. Application of bioethanol very favourably in one relation: burning of alcohol allows receiving 34 percent more electric power, than was spent for its production. Cubic meter of the processed grain equals to 270 — 290 l of the pure bioethanol. In most cases applying bioethanol blending mix with gasoline increase its octane number and decrease in toxicity of exhaust gases. There are two main ways of biofuels use as a component of automobile fuel. There are lots of bioethanol blending mixes on the market such as E5, E7, E20 – mixes with the low content of ethanol (5,7 and 20 weight percent), the most widespread today. In these cases the ethanol additives are not only saves gasoline by its replacement, but also allows to remove harmful additives. These mixes can be used by cars without special modifications. The mix of 10 volume percent of ethanol with 90 percent of unleaded gasoline, received the name E10 in the USA. This fuel can be used and in engines of small volume: in lawn-mowers, boat motors, chainsaws, lawnmowers and similar equipment. As a result of this fuel application, the consumption of oil products decreases by 6 percent, emission of greenhouse gases, use of fossil fuel. However, though E10 fuel also allows to reduce emission of polluting substances in environment as alternative fuel it don’t consider. There are two main components of mix are 85 percent of ethanol with 15 percent of unleaded gasoline which call E85. Cars manufacturers quickly increase production with universal consumption of the fuel, flexible fuel vehicles working with E85. The automated systems of fuel supplying allow regulating volumes of mixed products so it is possible to switch from E85 on traditional gasoline and opposite way. E85 fuel and also the high-concentrated mixes of E95 (95 percent of ethanol and the 5th gasoline) are considered as alternative fuels. The bioethanol blending with gasoline promotes its full combustion. 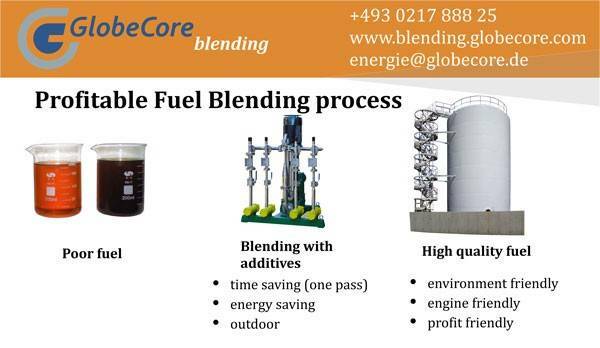 There is a GlobeCore Blending company which is producing equipment for a qualitative bioethanol blending in a stream with gasoline by any set recipe. Advantage of offered equipment is that applying an injection method and hydrodynamic blow, besides a qualitative mix, could raise octane (metane) number of fuel and stratifying of the final product doesn’t occur within 180 days (is guaranteed). Modern hydrodynamic mixing installations proved in commercial operation as economic, exact and stable equipment in production of high-quality fuels and liquid mixes with optimum prime cost. If you want to reduce expenses of you company for fuel production, “USB” cavitation blending system could help you to do that. To receive extra information contact us and technical manager will call you back or download inquiry list and receive free catalog.